Our Paws & Claws Days are for children ages 4-14 who love animals. They get to meet animals, learn a bit more about why we have rescue shelters and how to look after pets, play in the agility field with friendly dogs and then after lunch we get busy with some crafting fun. Our Easter Holiday activity days are Tuesday 16th April for 4-7 year olds and Wednesday 17th or Thursday 18th April for 8-14 year olds. To sign up and join us for one of the days please get in touch with Emma on 01225 787334 or email:emmahildesley@bcdh.org.uk. Looking for an exhilarating challenge for 2019, or do you have a fear of heights you want to conquer? We are looking for 20 brave individuals to join us and abseil down the magnificent Uphill Quarry in Somerset. Organised by our friends at Adventurous Activity Company, their team of fully qualified instructors will give you all the training and support you need to complete the abseil, so no experience is necessary. 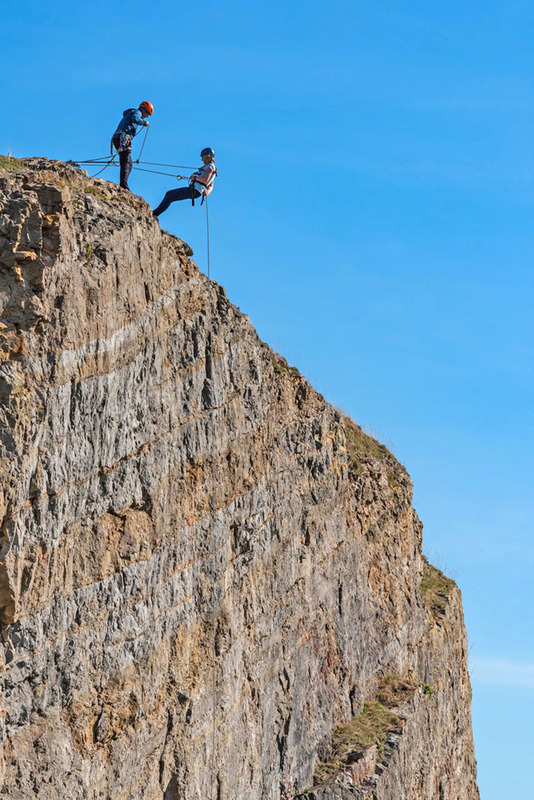 After getting kitted up and fully briefed by your instructor, you’ll take a short walk up to the top of the Quarry before the fun begins – you controlling your own 130ft descent down the quarry. There are some amazing views of the Bristol Channel, so don’t forget to take a look and enjoy the view. Take part in Bath’s biggest dog walk of the year with Bath Cats and Dogs Home. Choose either the 2 or 5 mile route and enjoy an organised walk across the beautiful Bath countryside for local animals in need. Every dog gets a doggie bandana and goodie bag! Cost: £15 per dog. Discounts on multiple dogs. Humans go free! Starts and finishes at Bath Cats and Dogs Home, BA2 7AZ. Make a splash in our giant fundraising event, and find out what it’s like to be rescued from the water by a 70kg doggie hero – a Newfoundland Rescue Dog. We hope to see you on Saturday 22nd June at Portishead Marina. For more information, and to book your place, call 01225 787334 or visit https://www.bathcatsanddogshome.org.uk/how_you_can_help/animal_events_newfoundland_rescue.